When it comes to picking a peripheral for your PC setup, the market is filled with so many choices that it becomes more confusing with such a variety of options. I’ve faced such a situation many times but my nature of being a particular brand lover has always saved me. Regardless, peripherals are more or less a personal choice at large and every user has different taste and opinion based on their experiences which still can be random. The two most important peripherals of the PC are the keyboard and the mouse. There are much more factors to be considered these days than it was before thanks to the mechanical keys introduction and advancement of technology. I liked and loved the membrane keys for quite some time and was a reluctant species to test the mechanical keyboard. Once, I tested the mechanical keys based keyboard, it was an instant fall in love for me and there was no going back. Corsair was founded in 1994. 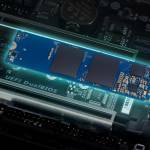 The company started as high-performance DRAM manufacturer. 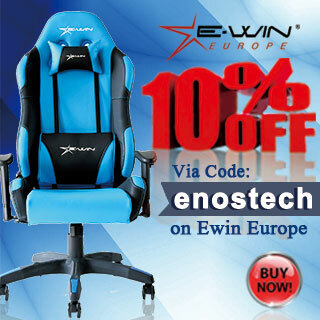 Now they are the provider of enthusiast-grade PC components and peripherals. 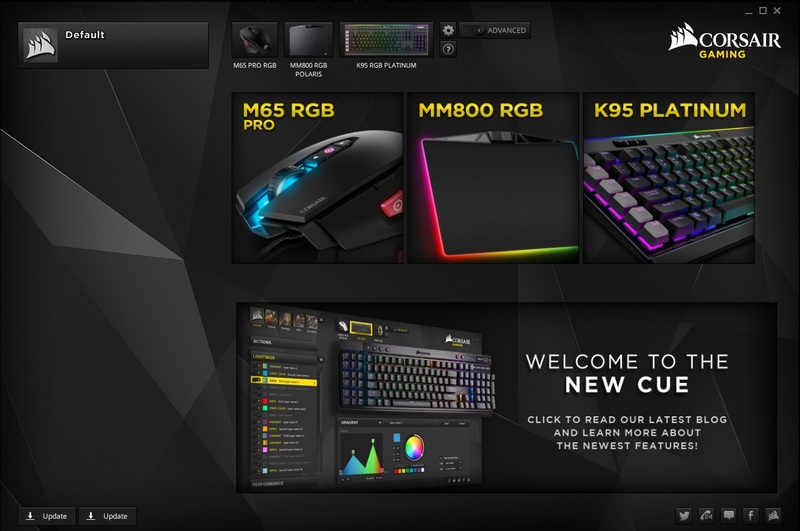 The company launched their Corsair Gaming brand in 2014 and targets the eSports professionals and gamers alike with the products like keyboards, mice, headsets and mouse mats. Now, Corsair is manufacturing products like Chassis, Power Supply Units, DRAM, Solid State Drives, cooling solutions for CPU and Graphics Cards, sleeved cables for their PSU units, and various gaming peripherals using cutting edge technology. I always rate Corsair as excellent based on their superb customer support program. Every time I had contacted Corsair over some issue or difficulty facing me, they responded well in time and always addressed the issue in a totally satisfactory manner. This is coming from my personal experience. Today, I will review Corsair K95 RGB Platinum keyboard mechanical keyboard. 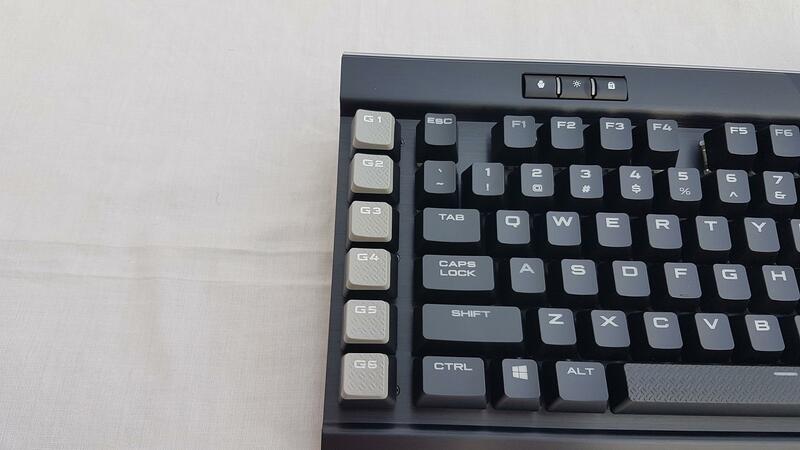 This keyboard is fully mechanical one and comes in Brown and Speed Cherry MX keys. It bears a beautiful and stylish design with the LightEdge being the part separating it from the competitors. The keyboard comes in a colorful cardboard box. Corsair band logo and name are printed on the top left side. Switch type is printed on the bottom left side. This keyboard has MX Cherry Speed mechanical switches. The main portion of the side is covered with the picture of the keyboard itself. 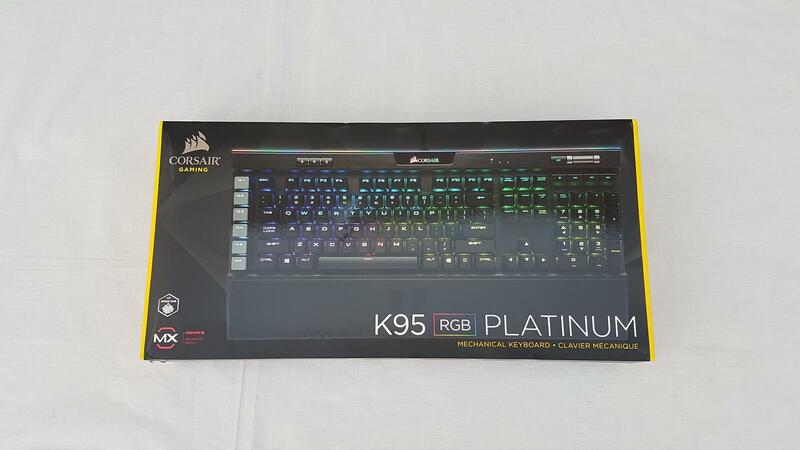 K95 RGB Platinum is printed above the bottom on the right side. 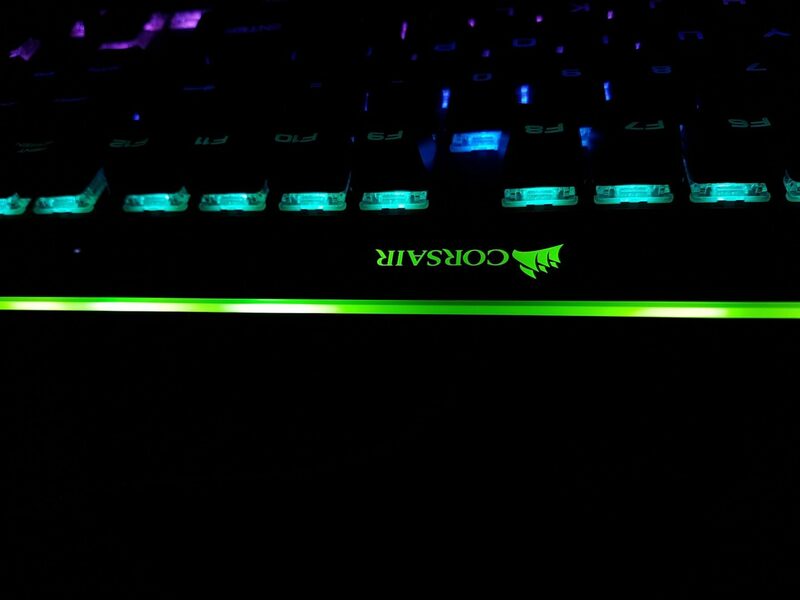 Multiple colors are visible on the keyboard picture signifying the RGB LEDs on the keyboard. Unfortunately, the local shipping company Leopard Courier (LCS) ruined the parcel as it was received with the box damaged from various sides. 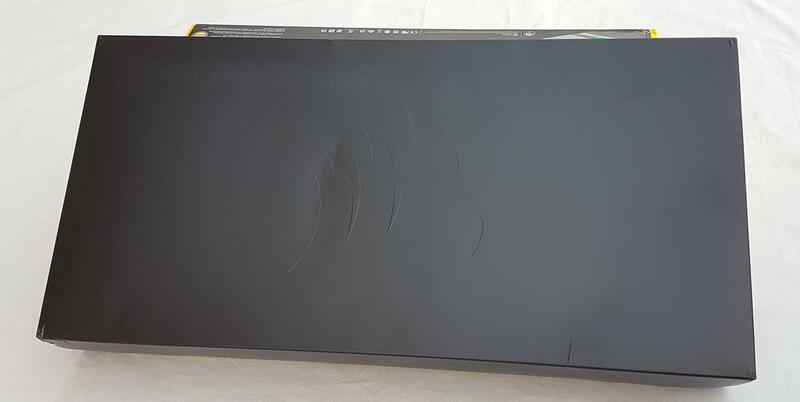 The backside of the packing box has the printed picture of the keyboard with salient highlights like dual-sided soft wrist pad cover, USB Pass through, LED Edge, MX Cherry Speed, CUE software control, Multimedia buttons etc. The right side of the packing has the main specifications and minimum requirements printed on it in 4 different languages. 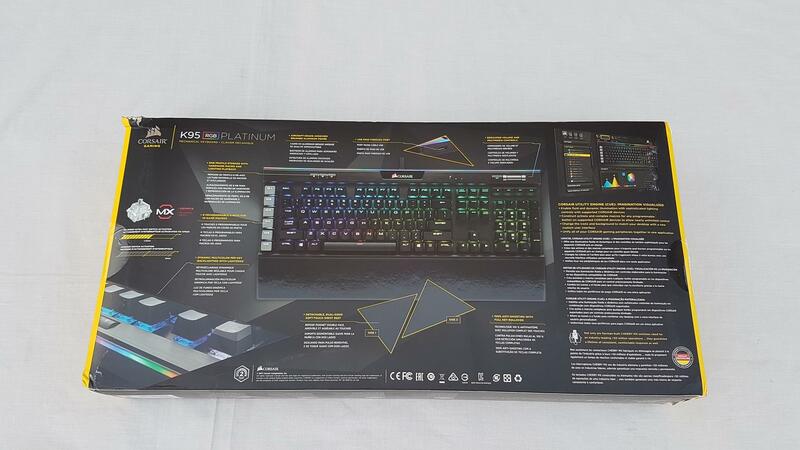 The right side of the packing has salient features highlighted like 3 onboard profiles, Dynamic multicolor per-key backlighting, FPS and MOBA keycaps provision, and fully programmable using CUE software. 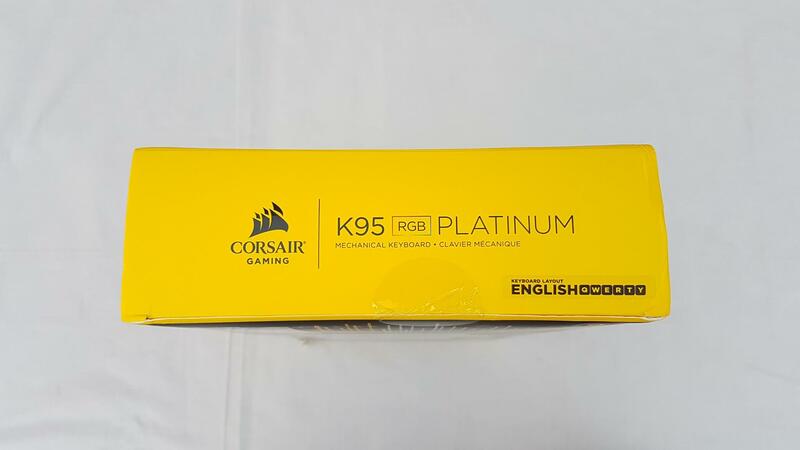 The opening sides of the box is in typical Corsair yellow color with Corsair Gaming brand name and logo printed on the left side and the K95 RGB Platinum on the right side. The keyboard layout is English, QWERTY. There is a container box within the packing. We have a stylish Corsair Gaming brand logo embossed on the top side of the inner container. Removing the top side would reveal the contents of the packing. 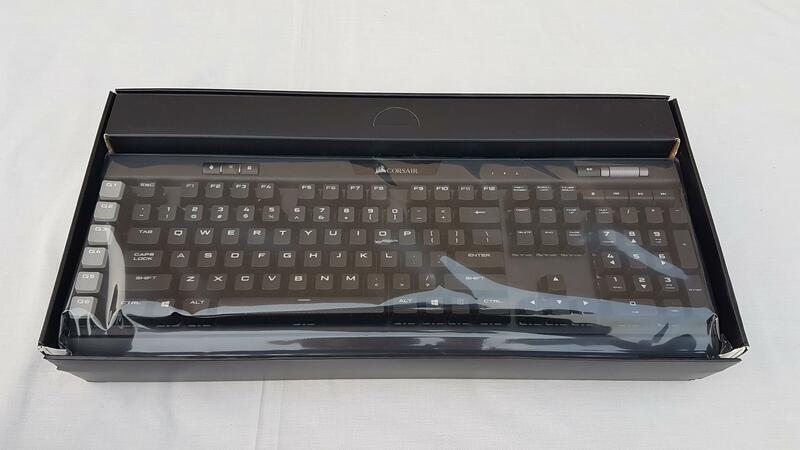 The keyboard is wrapped inside a plastic sheet for protection. USB cable is wrapped and tucked inside a cardboard box which is separated. Removing the keyboard would reveal the Accessories of the packing. We have a yellow color container box and a cardboard box having the wrist pad inside. 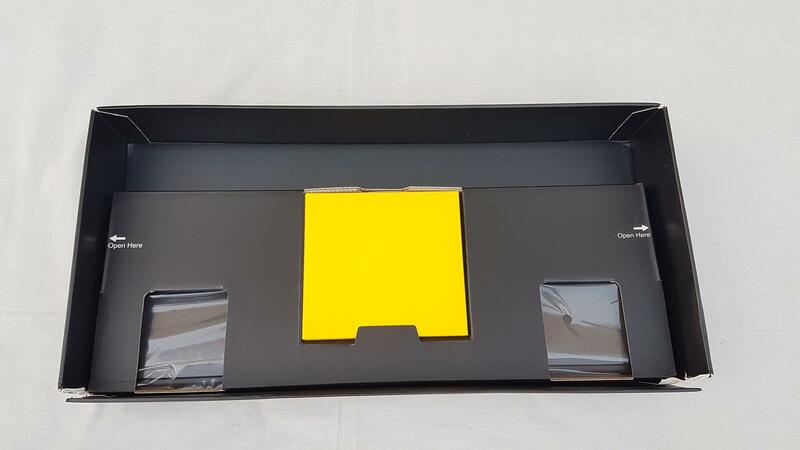 Yellow colored container box has the user guide, warranty guide, FPS and MOBA keycaps and key removal tool. 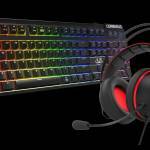 Corsair is known for producing some high end with top quality peripherals covering the wide range of the market based on the customers’ need and want. 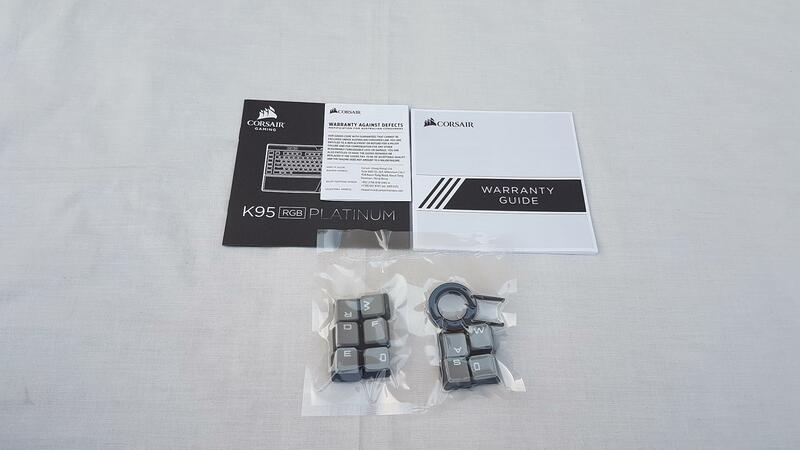 Their K95 has been the pinnacle of their keyboards. 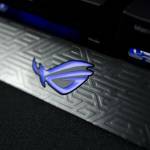 It is the company’s highest end offering and it is associated with the macro keys something MOBA and MMO users would love to have. 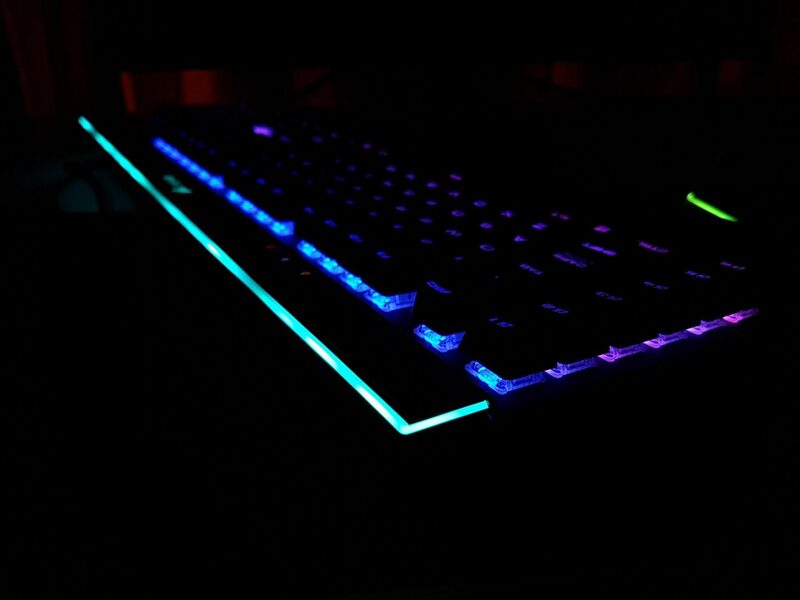 PC Industry took upon the RGB lighting in recent years and market was filled with the RGB lighting based components from almost all the manufacturers and it ranges from PC Components to the peripherals. Corsair was not behind and they were quick to release their RGB based PC Case Fans in the form of the SP120 RGB and HD120 RGB with the focus on the cosmetics and the performance alike. Corsair introduces the RGB Lighting on their peripherals to the extent that their headphone series of VOID also carries the RGB Lighting. The looks are subtle and the effect is mesmerizing. 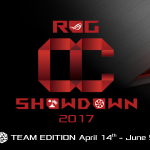 Even, we now have the mouse mat with RGB lighting to say the least. My personal experience with the MM800 RGB Polaris has been phenomenal. The Corsair K95 RGB Platinum is the new version of the K95 series and it has been implemented in RGB spectrum but in a unique way. One quick look on the keyboard while it was still in the packing box during the unboxing made me realized its simple yet very attractive design element. Let’s dig deeper on it. 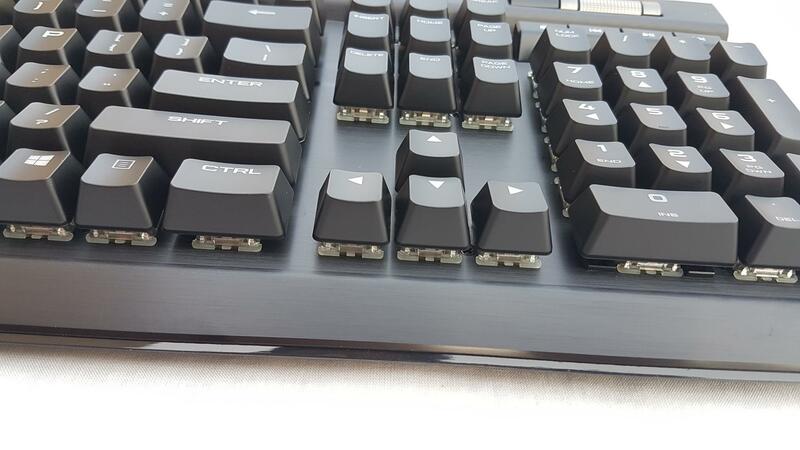 The keyboard has been implemented on Aircraft-grade Anodized brushed aluminum frame which speaks for itself. The touch and feel on the keyboard is premium by any means. This approach has enabled the Corsair to enhance the durability of their products and to reduce the weight where possible. With transportation in mind, it surely helps the gamers to carry the keyboard while going to attend any LAN gaming event. 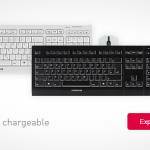 Keyboard has 100% anti-ghosting and it has full key rollover with the USB. 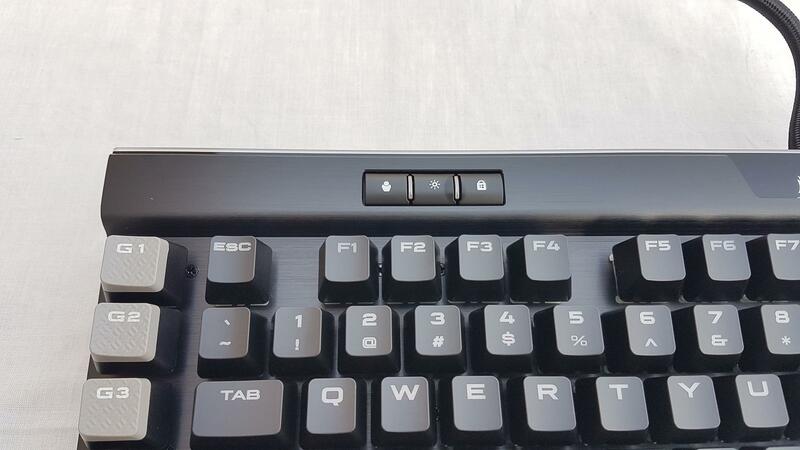 Starting from the left side of the keyboard we have 6 macro keys in a column. This version of the K95 has less number of macro keys as compared to the previous models but they are still enough in my book. They are textured for ease of identification without having to loop upon the keyboard yet they are contoured so that user may not press them accidentally. They are the only contoured keys out of the box besides spacebar. Their top side is implemented in light gray color to distinguish them from the other keys. User can use CUE software to assign macros to these dedicated keys. 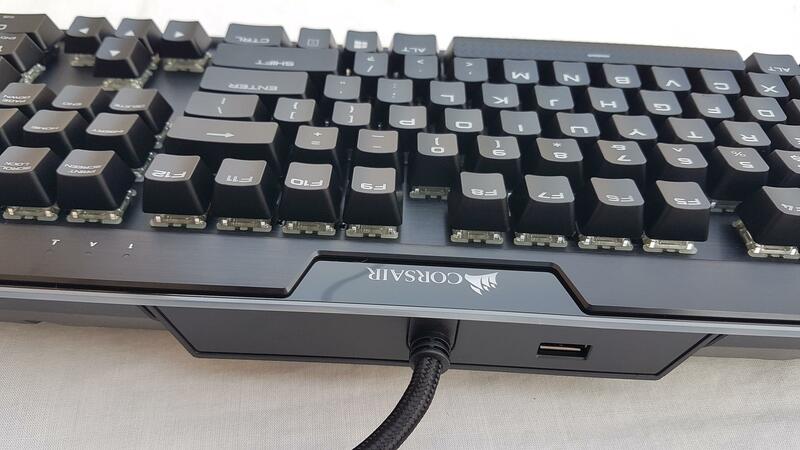 Moving further, we have a typical keys layout as can be found on any other Corsair keyboard. The top row has the Functions keys starting with the Escape key. Letters and numbers on the keycaps are enlarged so as to make the lighting effect more subtle and visible. Key caps can be removed using the provided tool for this purpose. 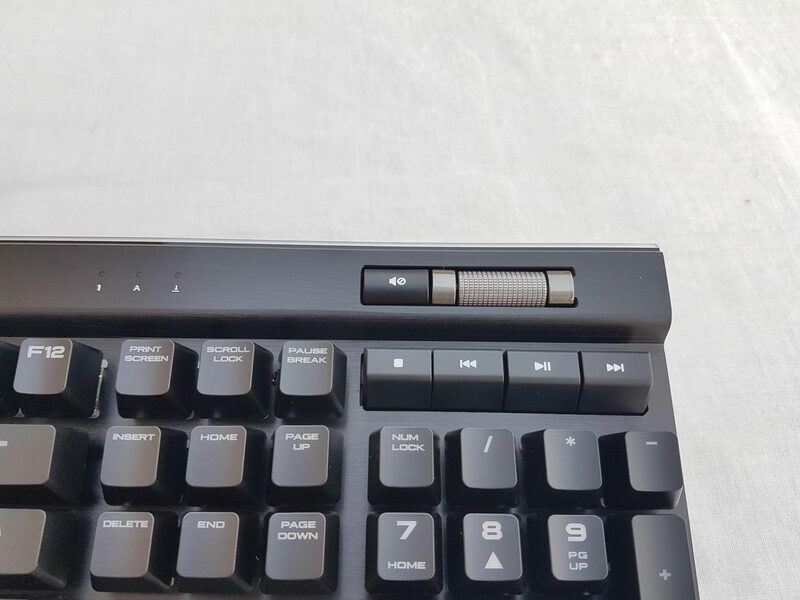 The spacebar keycap is contoured and it has a line on the center of the upper side which also lights up during operation. 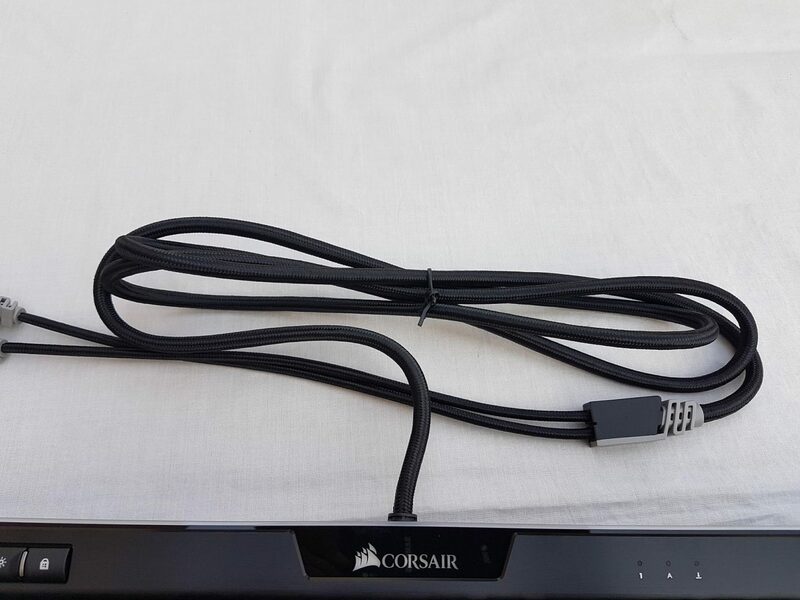 It is a smart move by the Corsair. We have traditional two ALT buttons on the right and the left side of the spacebar key being followed by the home key buttons. Keyboard layout is English, QWERTY. The Corsair has provided textured and contoured keycaps for the FPS and the MOBA style of the gaming. 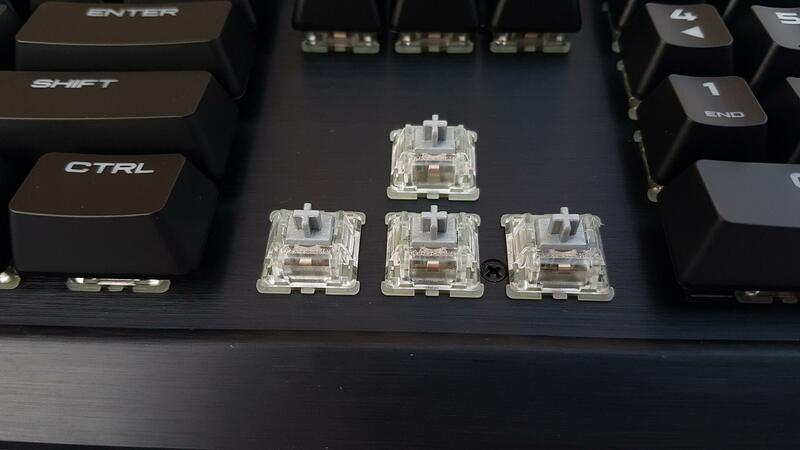 Corresponding type of the gamers can replace the keycaps with the supplied keycaps in light gray color. We have Print Screen, Scroll Lock and Pause Break buttons on the top side further ahead on the right side. 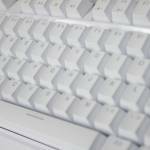 Like other keyboards we have INSERT, HOME, PAGE UP, DELETE, END and PAGE DOWN buttons following. Arrow buttons are on the bottom side with the arrows indicating the direction. On the right most side of the keyboard we have the numpad section with the same layout as on the standard keyboards. Multimedia section is implemented on the top side of the numpad and it is uniquely done by the Corsair. We have four buttons (not keys like) to control the playback of the media. We have a stop button followed by the fast backward/previous track followed by the Play/Pause button and the fast forward/next track button. On top of that we have Mute button. Right next to it is a volume wheel and this is where Corsair has all my praise for such a stylish design of the wheel. It is a contoured surface with silver color and it does look and feel premium when seeing or touching. In fact, when I was unboxing the keyboard, the very first thing which got my attention was this volume wheel. These are the small cosmetic items but by paying more attention to the details, manufacturers could for sure win the customers. It can be rolled up or down and with each roll there is a -/+ 2 in sound level. 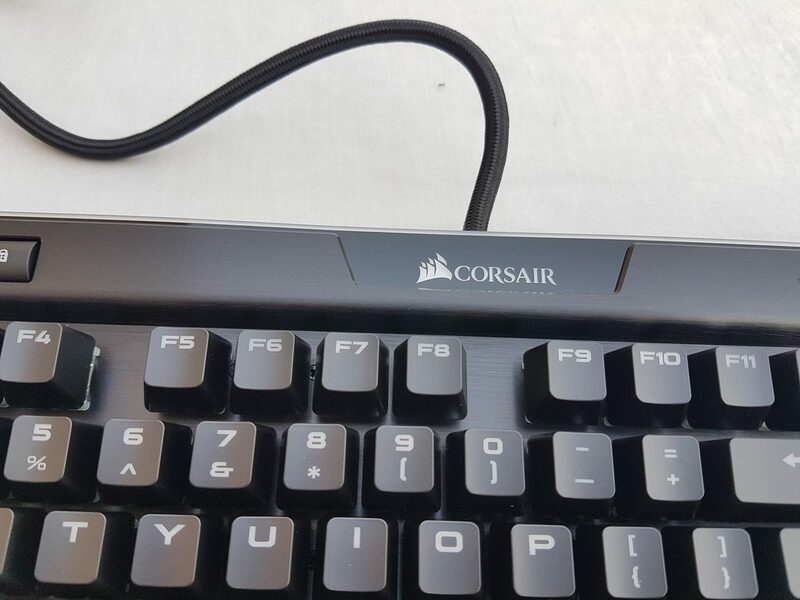 On top of the function keys labelled F1 to F4, we have another stylish group of buttons which is yet again done right by the Corsair. First button has a static brown color icon on it and it is used to switch to the three onboard hardware independent profiles. These profiles have been stored on the 8MB internal storage of the keyboard. 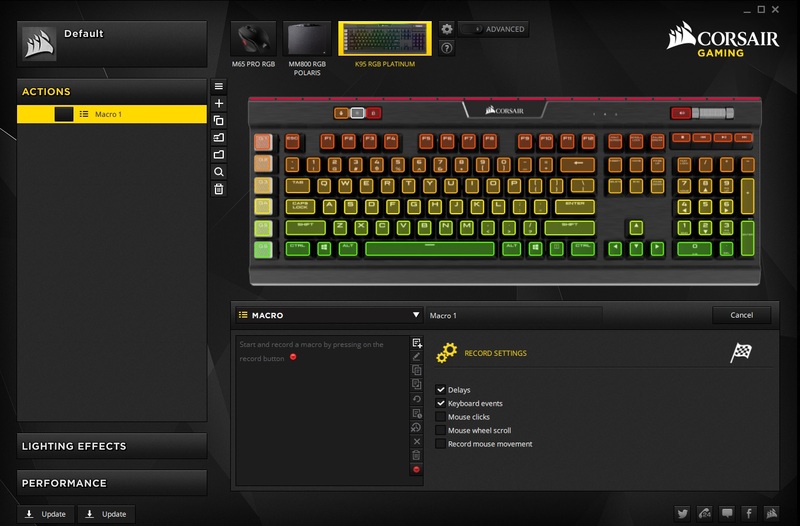 Corsair has made sure that users while going to the LAN events, can take along their set custom profile. Hands off to the design team for this minute level of thinking. It acts like a toggle button. Next button has the static white color icon and it is used to control the brightness of the LEDs. It also acts as a toggle button. One can turn the LED lights off or change the brightness as per the requirement to three predefined levels. Next button is a windows home locked one. It has a static red color lock icon on it. When pressed, the icon color changes to the light blue and it indicates that home keys are now disabled. Pressing it again would enable the home press keys and changes the icon color to the red. Please note that the colors of the Icons can be changed as per the user requirement using the CUE software. 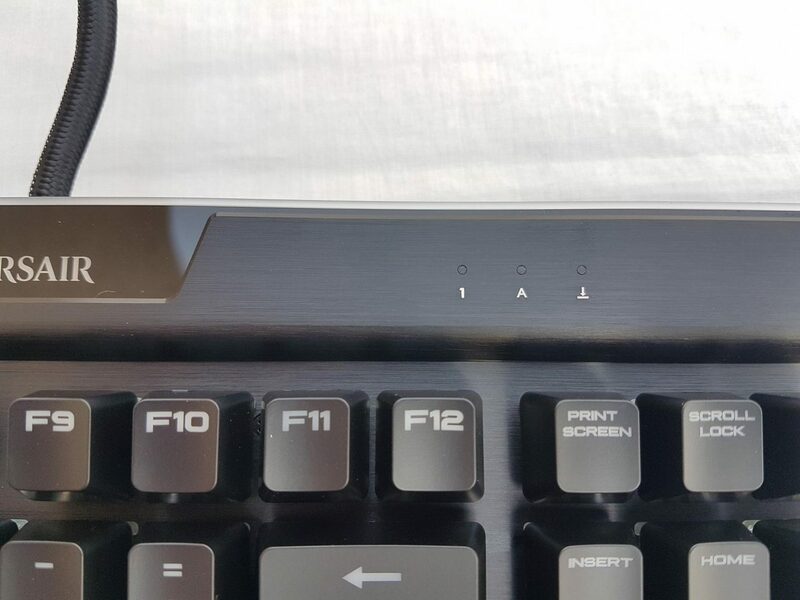 There are three dots with white color labels on them located before the Volume Wheel and above the F12 and the PRINT SCREEN keys. These are the indicators of the corresponding lock. First one has label of number 1 printed in white color and it refers to the status of the Num Lock. The center indicator has letter A printed in white color and it indicates the status of the Caps lock. The last one has the icon of the scroll or download printed in white color and it indicates the status of the Scroll Lock. Please note that indicator colors are static and white. Please note that the material used for the keycaps on this keyboard are ABS plastic which gets rough and starts to shine after some time based on the use and sweat /grease on the fingers adds further to this dilemma. 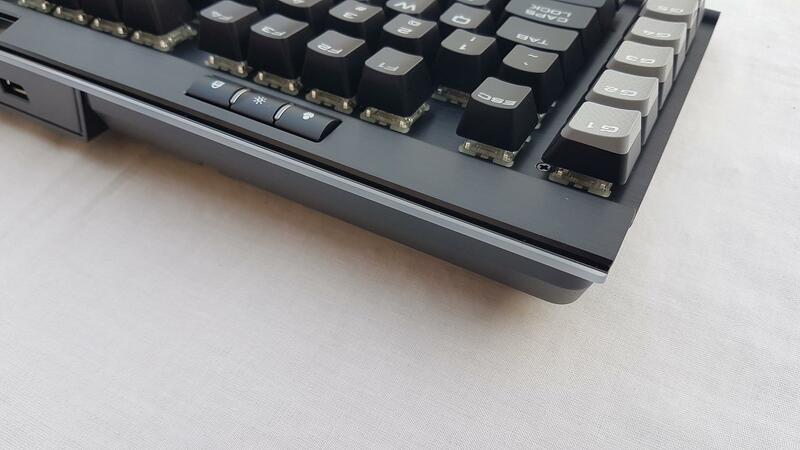 PBT material could save life here as it is more durable and less prone to getting shiny but the added cost of using that expensive material would make these already expensive keyboards pricier. It is time to discuss the most obvious selling point of this keyboard. 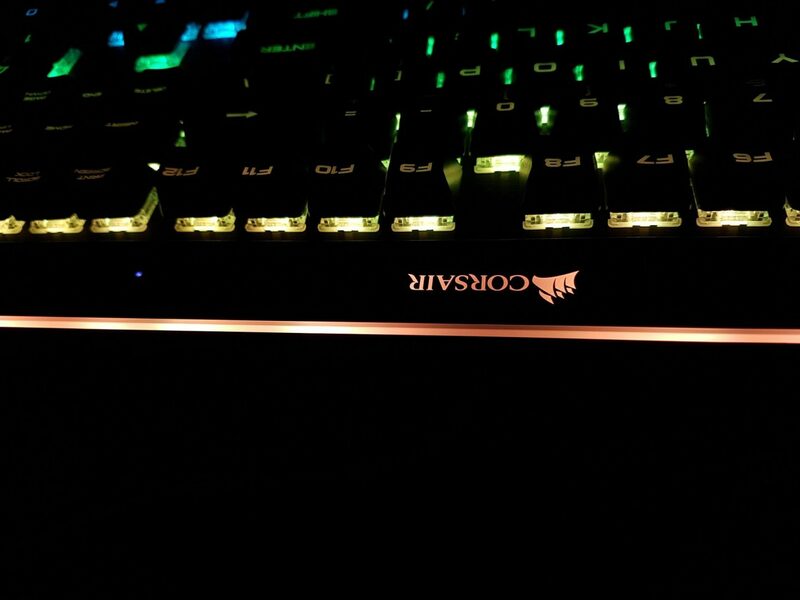 Yup, that is right the RGB goodness of the Corsair K95 RGB Platinum keyboard. 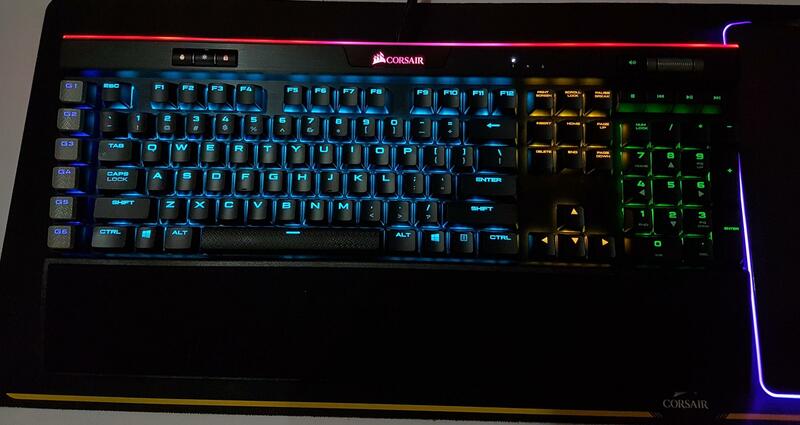 Corsair has put some good amount of thinking in the design element of this keyboard and has produced a marvelous piece of phenomenal design when it comes to the implementation of the RGB lighting. We have a dedicated area underneath the front side of the keyboard which all lights up. There are 19 independent zones on this section. 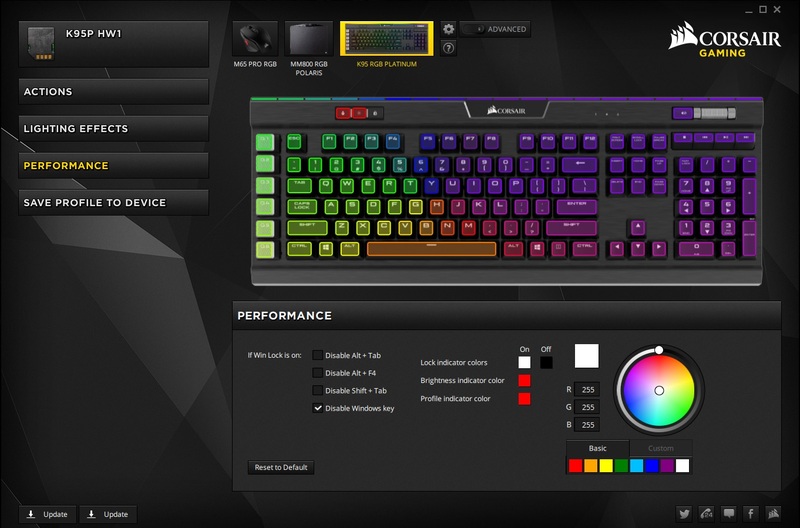 This section is being referred to as LightEdge and it definitely gives Corsair an edge over competitive offerings. This implementation reminds me of the Corsair MM800 RGB Polaris and how Corsair implemented the RGB Lighting on the mouse mat. In addition to the RGB Lighting under the per MX switch we have this lighting area which really adds to the overall looks and feel of the keyboard. 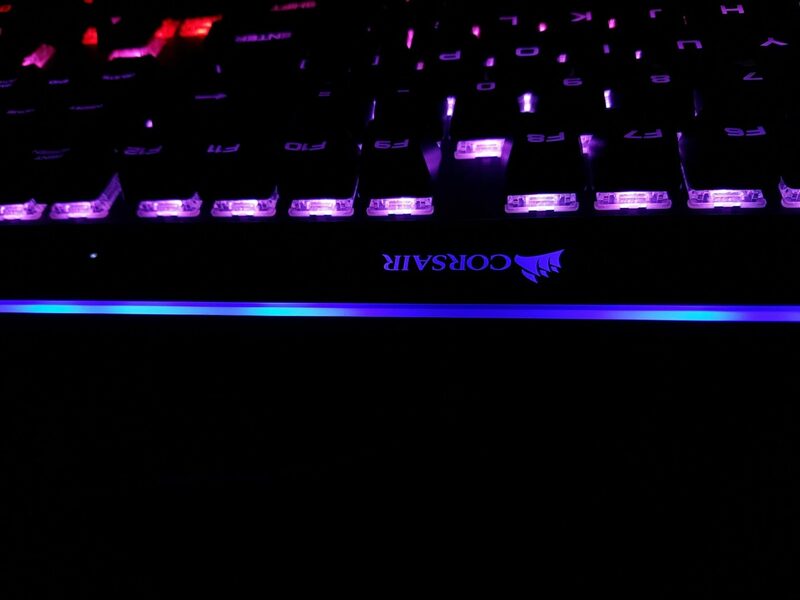 On the center of the top side of the keyboard, there is a Corsair Gaming logo and the CORSAIR brand name which also illuminates. This is the only area of the LightEdge which is visible to the naked eye. Rest of the area is hidden inside the brushed aluminum frame of the keyboard and only the raised surface of the LightEdge illuminates. Corsair logo and brand name area does not have LEDs underneath it. It rather illuminates by the three independent sections of the LightEdge facing it. 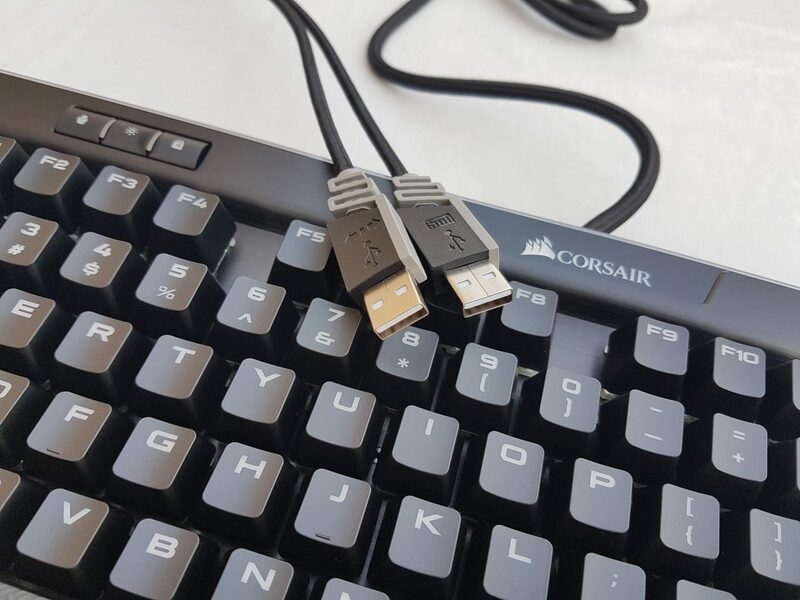 Smart move by Corsair as one can tell the difference apart. To control the lighting effect on the LightEdge, one must has to use CUE which is covered in the software section of this review. This keyboard has a detachable dual-sided soft-touch wrist rest. One side of the rubberized black color rest has a raised textured surfaced. Texture pattern has a group of 6 triangles making a flower shape and it is repeated across the surface of the rest. The other side has a flat not raised surface with grooves in the shape of small dots. I found the textured surface to be more slippery for my hands. The back side of the keyboard has another unique design time element. We have 4 rubberized feet on the back side with each on a corner. There are two latches on the top left and the top right side feet. 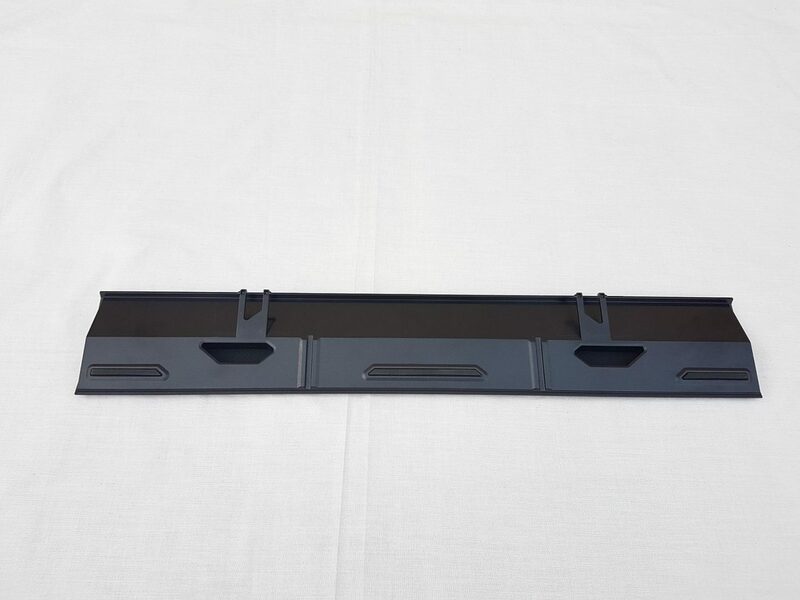 They can be opened to raise the surface of the keyboard in tilting manner which would be handy for typing and other stuff. There are an X shape pathways on the center of the frame with each end reaching to the borderline on both sides. This is one heck of an idea as to pass the cables of items like headphones under the keyboard to hide the bulk of the cables. 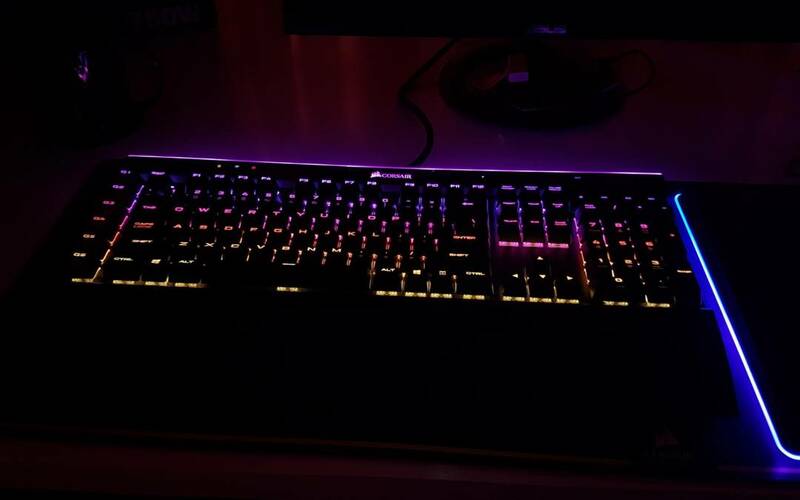 I tried with the MM800 RGB Polaris by connecting it with the USB pass through port on the keyboard. It worked like a charm but there is a Con to it as well. Once you have set the cables right and placed the keyboard, you can’t afford to move the keyboard as it would disturb the cables that have been tucked underneath it. Something for the Corsair to think about but I found this feature very handy. We have two tone front side colors. The central part is a dark grayish in tone. This is where the USB cable is coming out of the keyboard. I really wish that Corsair had implemented detachable USB cable approach instead of a fixed one. USB cable is braided and it has two USB cables on the other end. One is the keyboard USB cable while the other one is the USB Passthrough Cable. I really appreciate this idea of having a USB pass through cable. 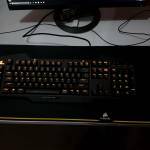 I have connected my M65 Pro RGB mouse with the MM800 RGB Polaris using USB port on the mouse mat and in turn, MM800 RGB Polaris is connected with the K70 Rapidfire. 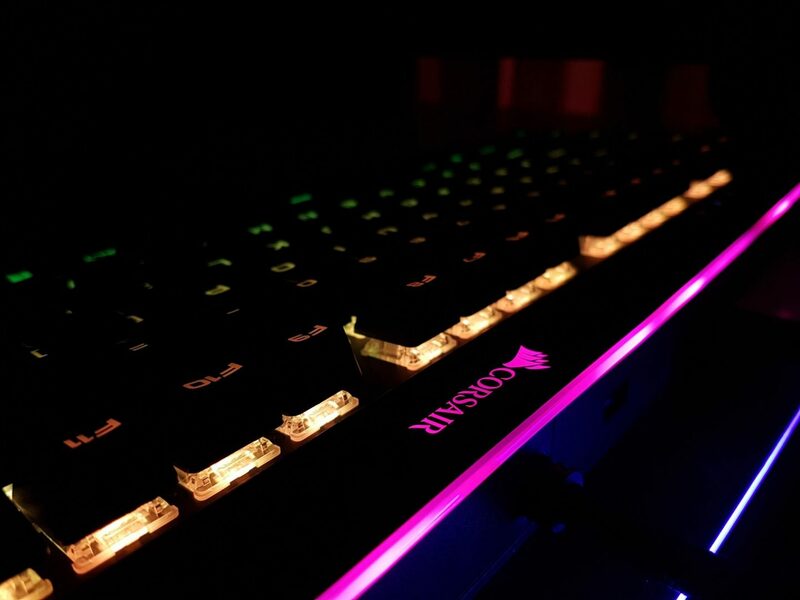 This keyboard features the 100% MX Cherry RGB Speed switches. 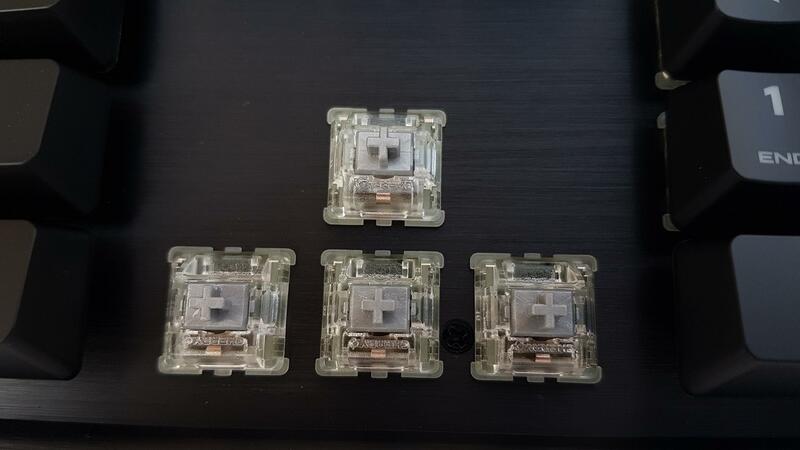 These switches are also known as Silver switches. 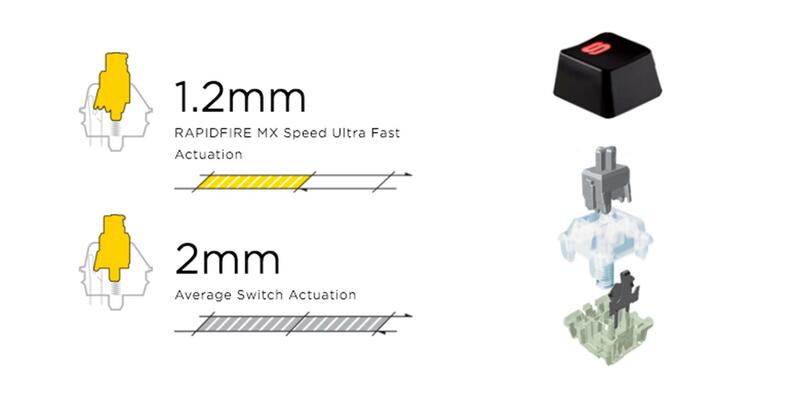 These switches have 1.2mm Actuation point as compared to the average 2mm actuation on other switches. This makes the typing on these switches a breeze. This is important as it would reduce the stress and fatigue on the hands of the users as the user would have to press the key with less force to make it actuate. This would also enable the users to write more in less time. The weight of these switches is 45gm. Their lifespan is 50 Million keystrokes as compared to common membrane keys with a lifespan of average 5 Million keystrokes. 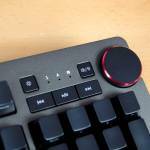 Cherry MX Speed switches are linear hence one would not feel any tactile bump or click. 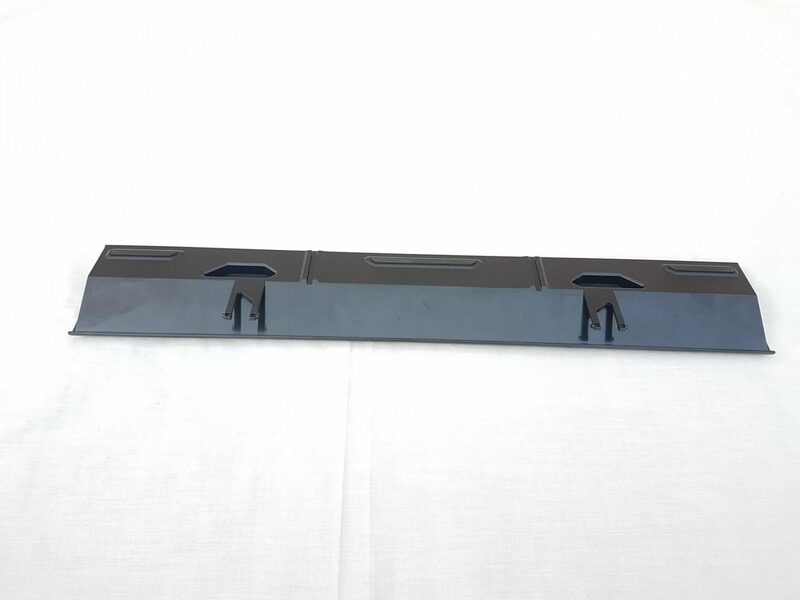 We have constant resistant across the travel of the key press. This makes them good for the gamers and they are being targeted at the gamers but persons who would like to type on these switches will still be fine. 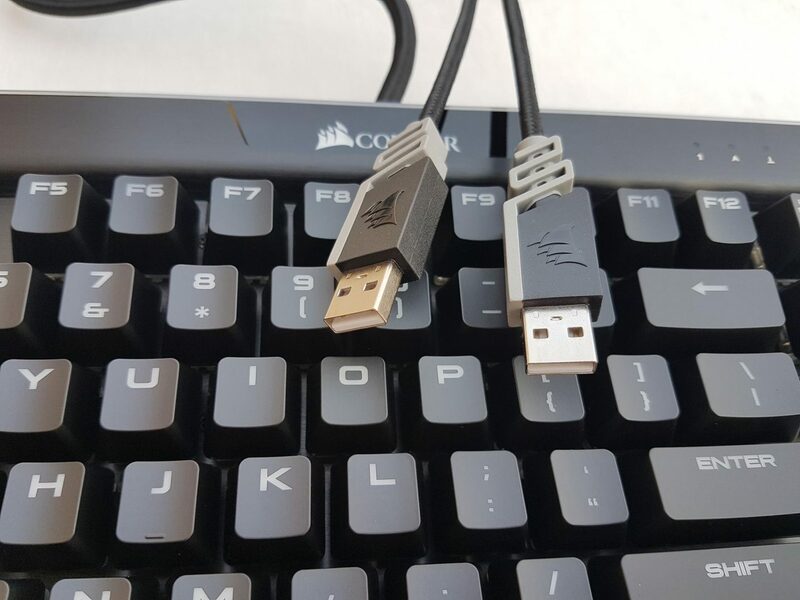 This makes it faster to trigger a key; 40% faster according to Cherry and Corsair. I tested the keyboard by gaming, writing and playing with pictures and their editing. I have used MX Cherry REDs and Blacks before switching to the Speed switches. Speed switches won me over the other type of the keys but Reds always hold a special value in my mind. Just speaking my mind. 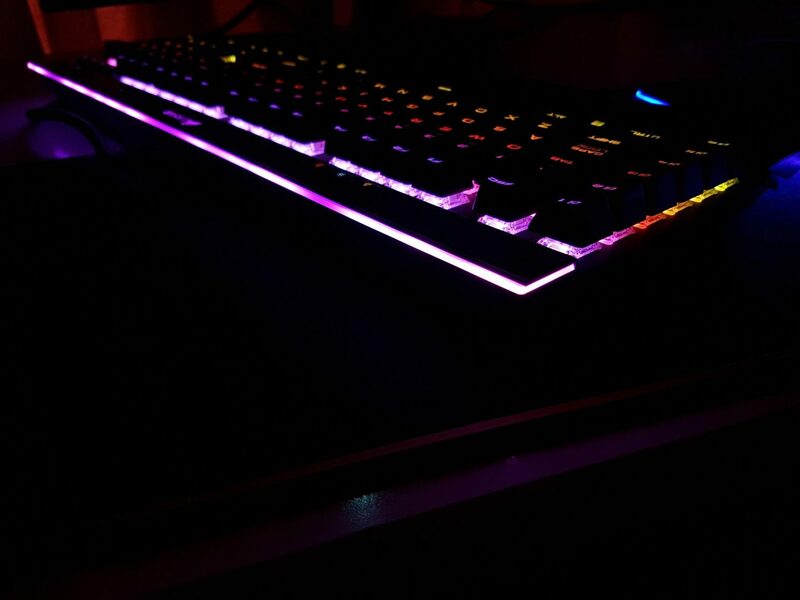 As my K70 Rapidfire RGB keyboard has the same switches as are on the K95 RGB Platinum, I found no difficulty what so ever to adjust myself to the switches. I love these switches and this should pretty much sum it up for my readers. Though it took me some time to get adjusted with the macro keys as they are implemented as a first column of the keyboard and I am used to having a keyboard which does not have macro keys. But that is not a complaint in any regard. I have absolutely no complaint what so ever in gaming, typing or doing any work on this keyboard. 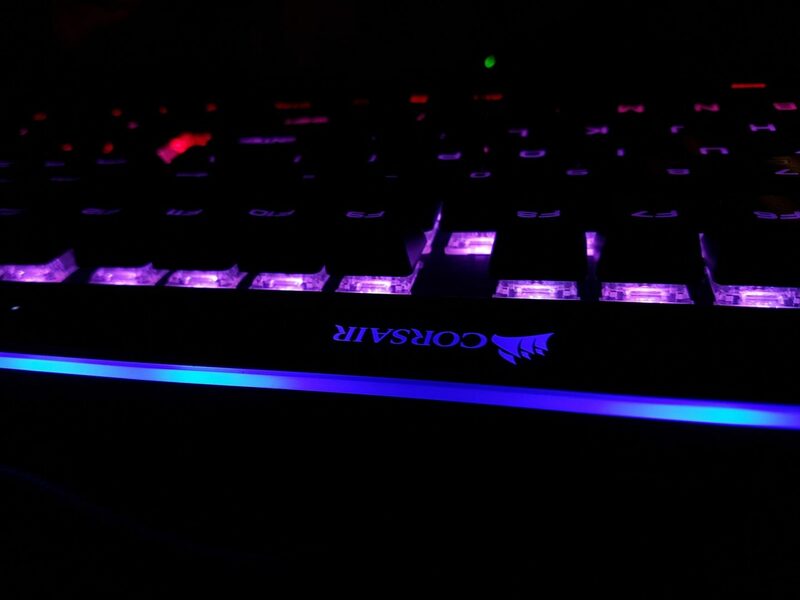 The Corsair has provided CUE software to be used with their RGB and Macro enabled peripherals. It is different from their Link software and should not be confused as such. CUE stands for Corsair Utility Engine. 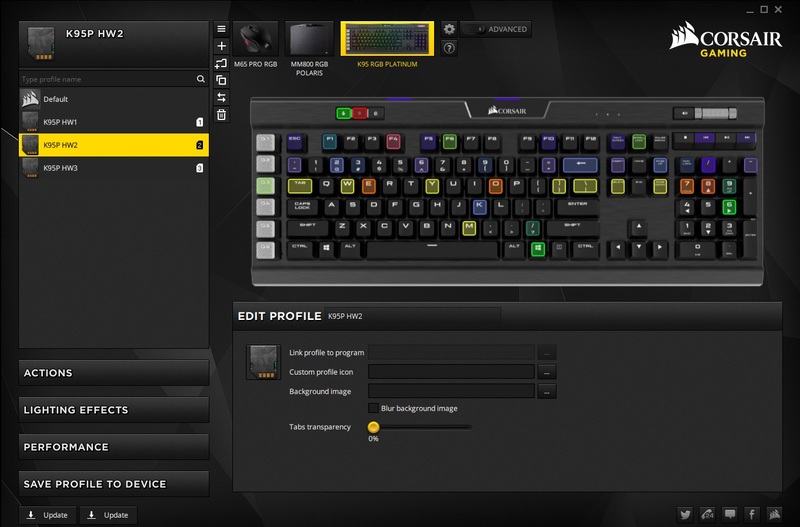 Corsair has improved their software and now users have a clean and simplified interface with support up to 4k resolution. It is also customizable much like the Corsair Link where users can add their own background image. One can construct actions and complex macros for any programmable key/button to allow nearly unlimited control of the peripheral. 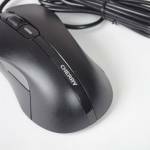 This software would automatically detect all the Corsair peripherals connected to the PC. 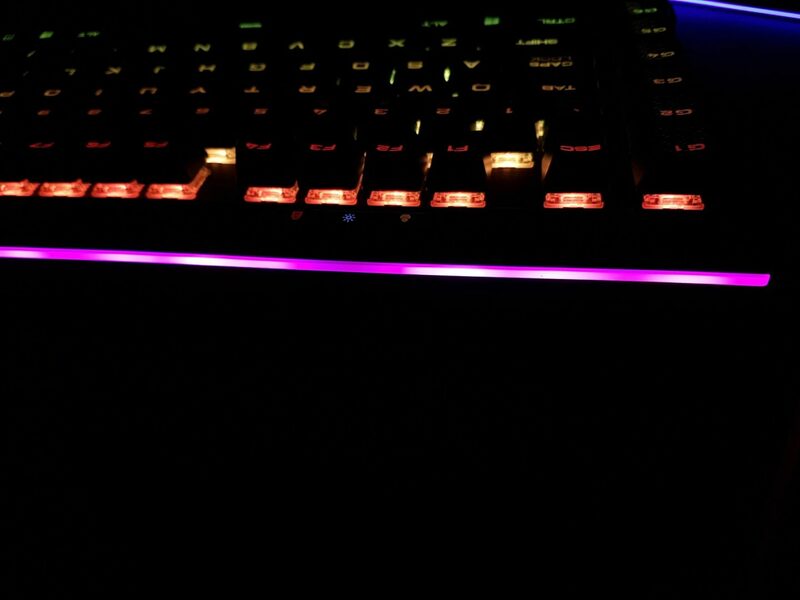 I am using Corsair M65 RGB Pro, Corsair M800 RGB Polaris and the Corsair K70 RGB Rapidfire. All the devices are detected by the software on its launch and users’ set profiles are applied across the devices. One can sync the color effects on the devices. The software also allows the users to upload their own created color and macro profiles which can then be accessible to all the users. Similarly, the user can download other users’ created profiles subject to one’s requirement and need. This is referred to as Corsair RGB Share. 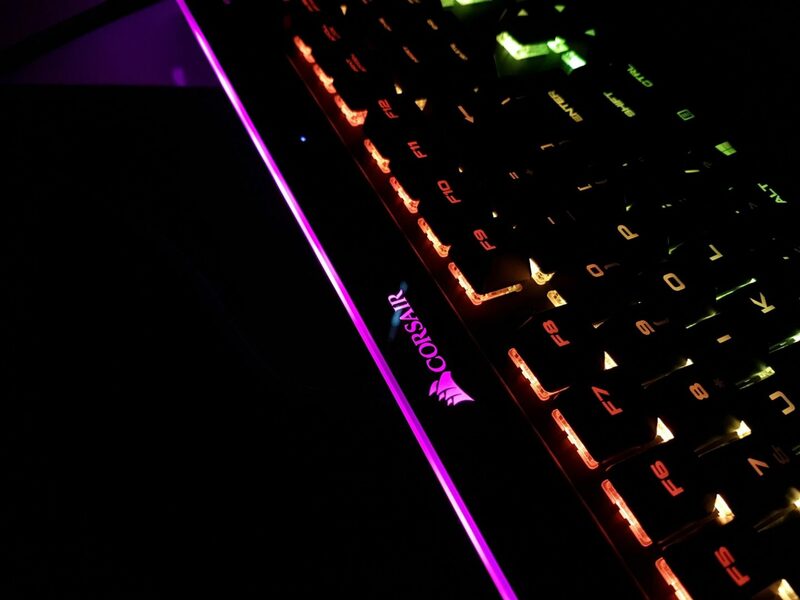 Corsair has provided predefined color effects like Rainbow Wave, Static, Rain, and Ripple etc which novice users can utilize to set the RGB color effect on their devices. Though one can create own color effect easily. 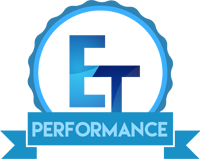 Similarly, Macros can be defined by the users under the Performance tab. This is not a guide on how to use the CUE software but I would be showing some interfaces for the users. The main window of the software shows the connected devices. The default profile is displayed on the top left side. Advanced options and settings buttons are on the right side. Last button would delete the selected layout or profile. Below two pics shows the custom color effect which I created just for the review purpose. The first pic shows the layers and their colors in the CUE software whereas the second pic shows the real effect on the keyboard. The Corsair K95 RGB Platinum has three built-in profiles named as K95P HW1, K95P HW2 and K95P HW3. 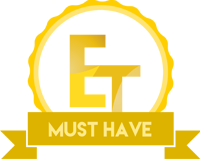 Each one can be selected and configured in addition to creating unlimited new profiles. The Performance tab has more settings for the users to customize the keyboard the way they want. One can define what action is performed when the Win Lock is pressed. Its default action is to disable the Windows key. This is a handy feature as it could save from disruption in game play by pressing the windows key accidentally. The user also has the option to change the colors on the Profile Switching button, Lock Indicator button and the Brightness control button. To define the Macro, one would need to select the device first and then click on the Action tab. The interface is easy to use and pressing the red dot button would start recording of the action. Recorded macro can be edited, copied, and deleted if and when required. 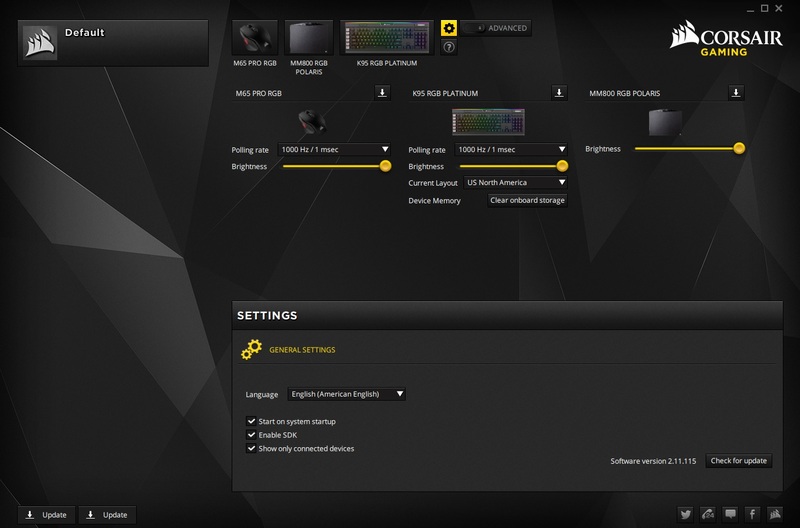 Clicking on the Settings button would show the settings of all the connected Corsair devices. The user can change the polling rate, brightness, layout type depending upon the device configuration possibility. By default, a Demo device is shown in the software for Corsair VOID which can be disabled in the Settings menu by checking the Show only connected devices option on the bottom side. 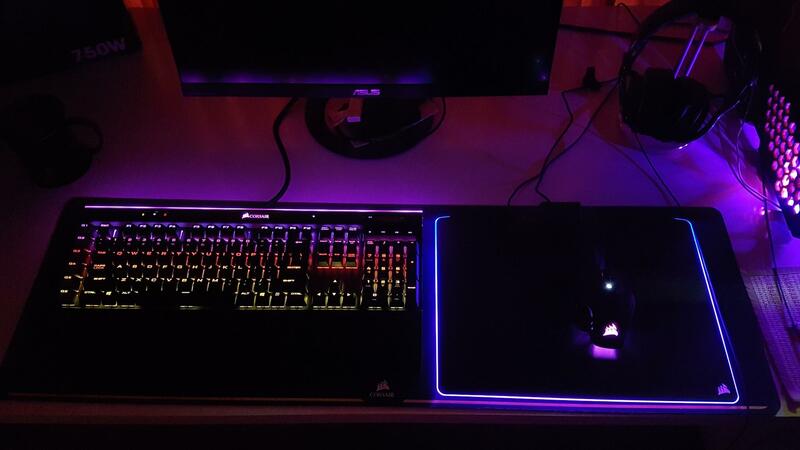 Corsair CUE has got everything, the Corsair users would need to truly customize their RGB peripherals. Corsair has once again set the direction of the competition with its revamped design on the K95 RGB Platinum giving it one heck of a combination of the cosmetic and the performance. 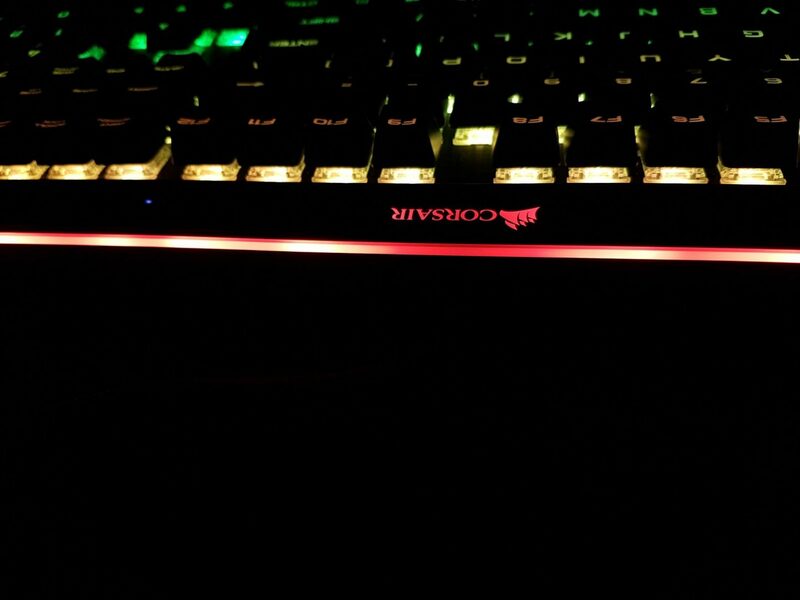 When it comes to the giving the attention to the details even on the minute level, Corsair stands out and is top notch. This keyboard has simple keys layout mapping but this simplicity has been beautifully enhanced with the use of the LightEdge having 19 independent zones for full-color customization. Cherry MX RGB Speed give this keyboard a final nudge out of the competition to stand it out and speaks for itself. Detachable dual-sided, soft-touch wrist rest is done immaculately. 100% anti-ghosting with full key rollover is a plus. Provision of 3 built-in profiles is a plus. 6 dedicated macro keys are textured and contoured. The light gray tone of the top part of these keys blends in very well. 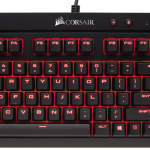 Corsair has taken care of the FPS and MOBA gamers alike by providing textured and contoured keycaps which can be replaced with. The looks and feel of the Volume Wheel are premium. 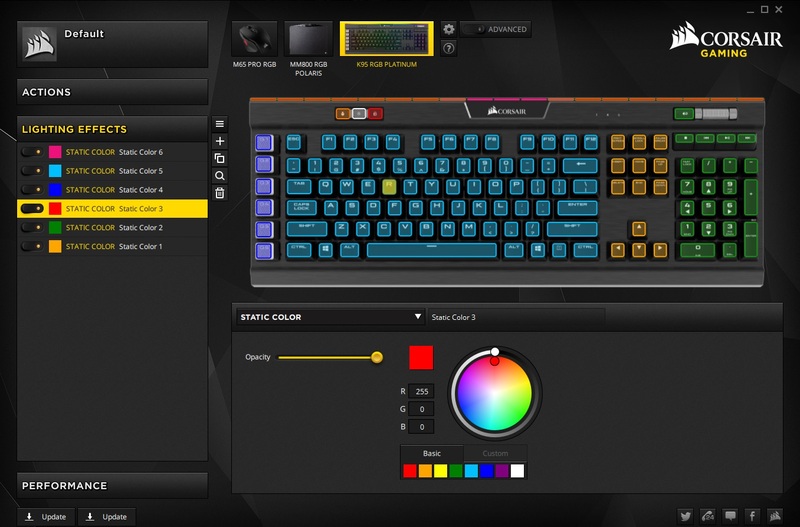 True color spectrum is at the disposal of the user using simple yet powerful software called CUE (Corsair Utility Engine). Provision to route the cables underneath the keyboard is what I had in my kind for quite some time and Corsair has done it though it might need further improvement. Literally, I have no complaints with this keyboard except that of the high price tag which obviously makes it point given the features and performance on this keyboard. 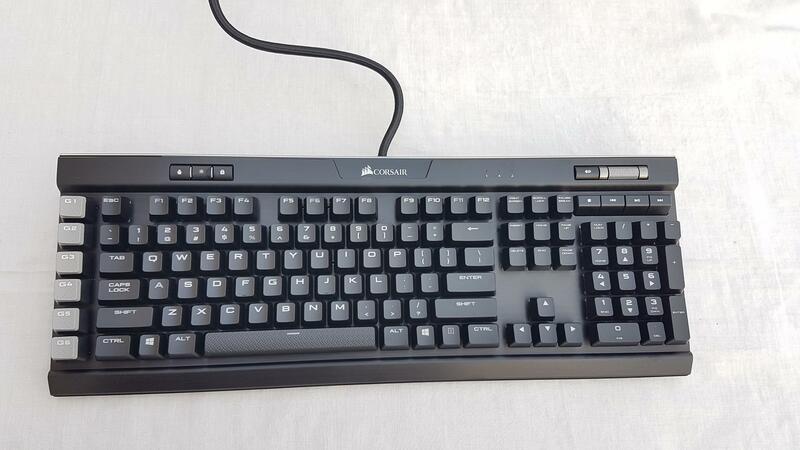 This keyboard features the Cherry MX RGB Speed switches. These switches have actuation of 1.2mm as compared to average 2mm actuation point of other switches. This would enable the user to type more in less time with less stress and fatigue. Keys are placed and oriented very well. Multimedia buttons are superbly executed in their design. 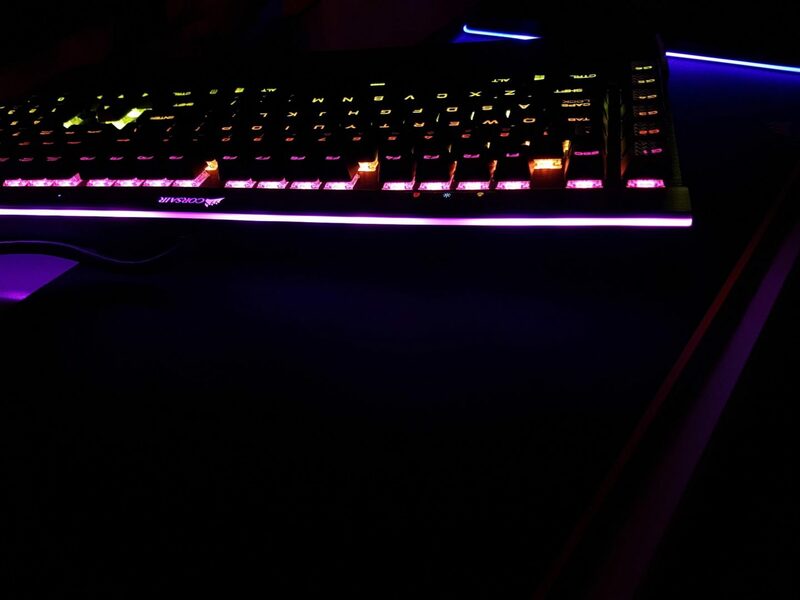 All this performance is backed by the RGB goodness in the form of the LightEdge which is really a unique way of implementing the RGB lighting on the keyboard. 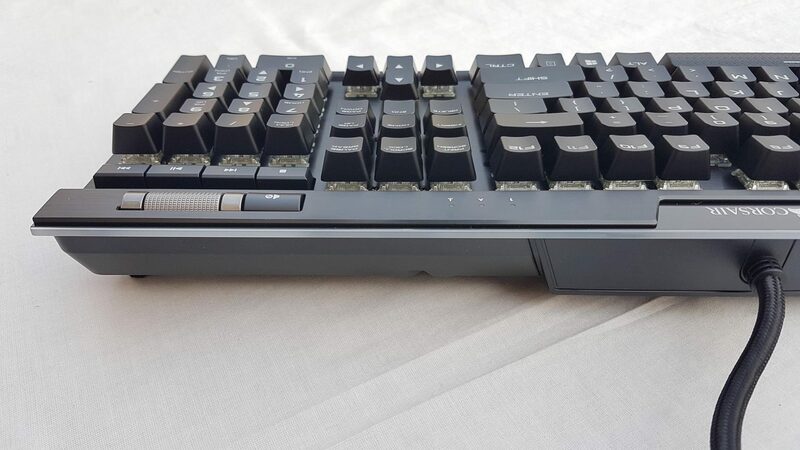 I have spent quite a time with this keyboard and during gaming, typing, pictures editing, I was always comfortable and never met with any glitch. Here it comes to a part where I would have to define if the product is that good and that if it deserves your bucks which in this very case are going to be quite taxing. 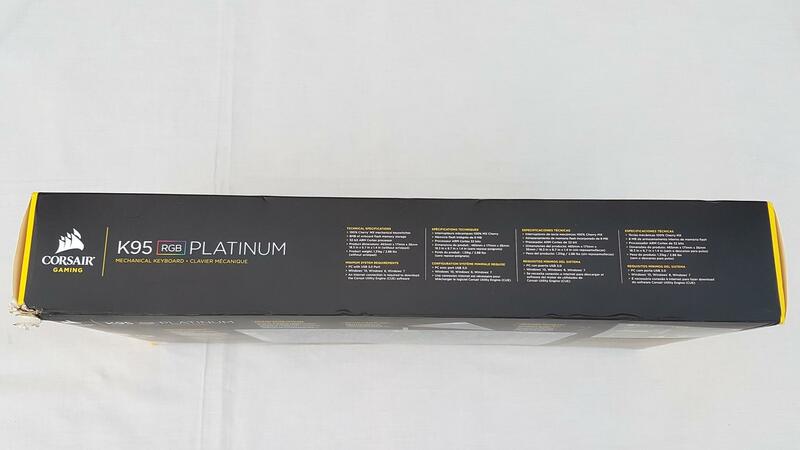 If you are a person who loves cosmetic, premium build quality, RGB lighting taken to the next level of implementation and has got the budget then look no further as this is the ultimate solution for you. 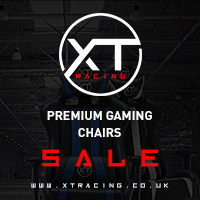 If you are not that type of a person then you can have a look at less expensive solutions like K70, Lux etc from the Corsair. I belong to the first category. 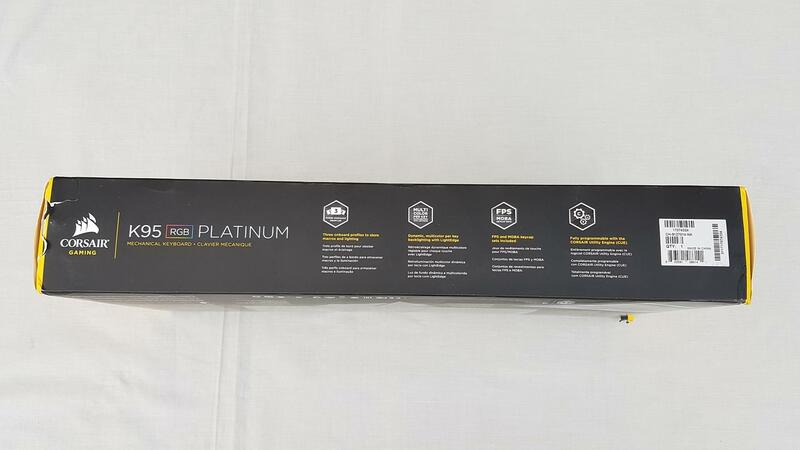 I am thankful to EEZEPC for providing me the Corsair K95 RGB Platinum for the review.